SkyDive Uluru is the only tandem skydiving operation that skydives right next to Uluru (Ayers Rock)! Operating all year round, you can experience the thrill of skydiving in the 'Red Centre' of Australia. 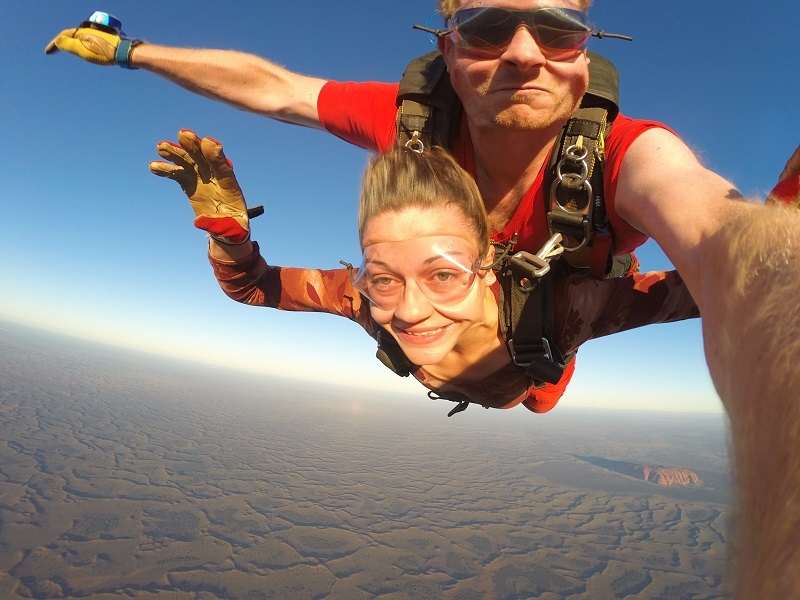 Take home a once-in-a-life-time momento of your jump so you can re-live the adventure of leaping out of a plane right next to Uluru (Ayers Rock) and Kata-Tjuta (the Olgas). Embrace the thrill of a free fall followed by a peaceful parachute ride over this beautiful region of Australia or just enjoy a longer parachute ride to soak up the views. A Tandem Skydive means you are attached to a Professional Tandem Instructer ie (1 passenger = 1 tandem instructer). 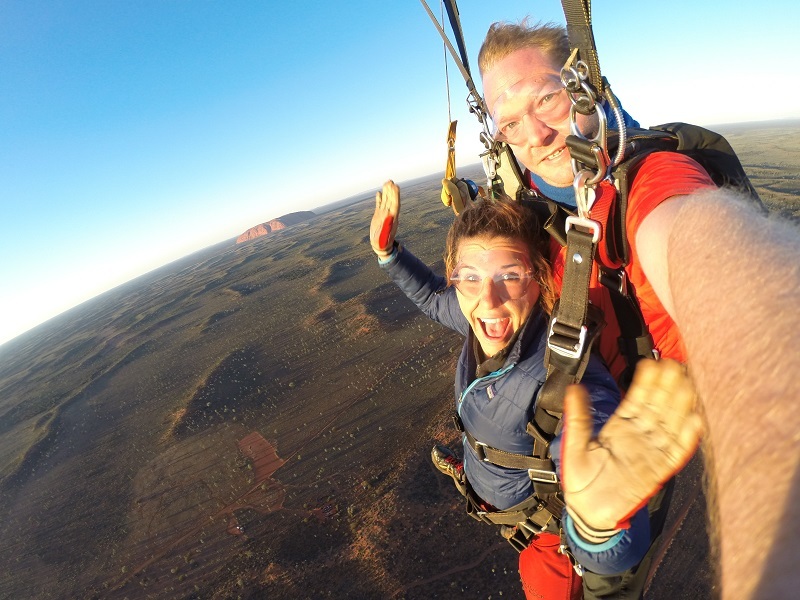 Fly up to the skydive altitude passing right by Uluru with views of Kata Tjuta, Mt Connor and Lake Amadeus. Exit the aircraft from 12,000 feet or 10,000 feet. Enjoy a long, thrilling free fall and a parachute ride of 4-5 minutes. Uluru is right there in front of you! NB: 12,000 feet flights are also available at sunrise & sunset. Alternatively, you may exit the aircraft and enjoy a blissfully silent parachute ride and scenic view of Uluru (Ayers Rock) when your parachute opens shortly after leaving the plane. Enjoy a longer than usual parachute ride of 8-10 minutes. Prices are the same as listed below for this experience. Why should I choose Skydive Uluru? It will only take a couple of hours of you time, no need to wait your turn. If I book a skydive for a single, does it mean I am jumping on my own? We only offer Tandem Skydiving, this means each passenger jump with a professional skydiving instructor. We will not let you jump alone if you are not a qualified and experienced skydiver.Booking for a "single" means that you are booking for one person only to go skydiving with one tandem instructor.Booking for a pair/couple, means that you are booking for 2 passengers at once, and therefore 2 tandem instructors.Your harness will be hooked to your tandem instructor and he will be the one opening the parachute. You just need to relax and enjoy! What is the best time of the day to jump? Sunrise and Sunset are the most popular times due to the amazing light on Uluru and its surroundings. Please book prior arrival in Ayers Rock Resort to save a spot as we have only 2 spots available per sunrise or sunset! According to National Operational Regulations O.R. 9.7.2 “a parachutist must not carry a camera during a descent unless the parachutist holds at least a Certificate Class C’” If you don’t hold this certificate, you are not allowed to take your GoPro or any device with you during a skydive in Australia. You can purchase a HD Video&Photo package of your jump on the day of skydiving. In winter (June, July, August), please bring a long sleeve jumper as it can be very cold up the the air, especially at sunrise. Long confortable pants, avoid jeans. Lace-up shoes like runners. In summer: T-Shirt (with short sleeves, avoid singlets), confortable shorts. Lace-up shoes. Please no thongs/flip flops nor sandals. We provide overpants, goggles and gloves. Our weight limit is 95kg. If you are over, it doesn't mean you cannot jump. If you are over 95kg, please let us know at the time of booking and we will check other criterias directly with you. If you weight over 95kg and it has been decided with the qualified staff members that it is safe to go skydiving, extra fee will apply. Basic level of fitness required, enough so you can lift your legs up for landing. Do I need a medical certificate to go skydiving? * Cancellation within 7 days, incurs a 100% cancellation fee. * Tours must be booked 48hrs in advance of the date of travel. Confirmation for this tour will be received within 36hrs- subject to availability.